Eight o’ clock, the alarm goes off. Groan! Stop bitching, you’re going to be in Scotland tonight! While my travel companion is taking a shower, I go about preparing breakfast. We already sorted our luggage the previous night, so after a lengthy breakfast we’re on time when the doorbell goes around ten thirty. This is another friend who will take us and our assorted luggage to the airport in her car. The check-in counter isn’t open yet, so we get our first taste of British lifestyle: forming an orderly queue. Since we managed to check in on-line to the flight to Heathrow, we actually get priority treatment after they do open, so we breeze through with enough time to spare for a warm meal, but not enough time for a spell of fresh air. The acoustics at the airport are very good, so it’s not noisy at all, and the bathrooms are very clean. Two facts we will come to appreciate later on. Our flight is on time, and after touch down we realize how huge Heathrow really is. However, after approximately two hours of being cooped up in a winged metal box, we enjoy having a little walk. We have no problem finding the luggage reclaim when we do arrive – which our luggage does not. So, the endless wait begins, while flight after flight which is actually below us on the list gets their belts assigned. Why they and not us? What a cruel world, we think, as we keep checking our watches and start getting fidgety about our connecting flight. Even with our wrist watches already set one hour back for local time, it seems mightily close. Finally, it’s our turn, and we get a trolley and follow the signs to the central bus station, where they rip us off for a ticket to the Gatwick shuttle. A few days later, we will get from Inverness to Glasgow for the same price! That’s London for you. Our bus driver does what he can to get us to our destination fast enough, but first he has to go to Terminal 4 to pick up some more passengers, and getting there alone takes about half an hour. Did I mention Heathrow was huge? Next, we’re stuck in rush hour traffic. The bus’ clock says five thirteen, so no surprise there. Now we’re really getting worried, since our connecting flight is scheduled to leave at seven fifty, and if we’re stuck in traffic for a couple of hours, we’re doomed. Wait a moment, five thirteen? Didn’t I set my watch and it says four thirteen? Now totally confused, I switch on my cell phone and it says five thirteen, so the bus’ clock is actually on continental time! I switch my cell phone off again. While I relax a bit I get my first glance of Scotland: a car with a Saltire sticker on the back. Finally, two of the five lanes branch off the motorway, and once we’re through the junction the traffic starts flowing. We reach Gatwick South Terminal at ten to six, and the place is a zoo. Obviously an older airport not constructed for the amount of people in it at the moment, it is not only cramped but also very noisy. We find a monitor that leads us to our check-in counter. Luckily, the queue dwindles very fast, so it’s out turn in no time. The lady behind the counter asks us some security questions. Do you carry meat products? No. Do you carry dairy products? No, I lie again. After all, the big sign at Heathrow only mentioned about not importing them from outside the EU, and this is a domestic flight anyway. Besides, I’m hungry. After a visit to the bathroom with the loudest hand dryer I have heard in my life – remember nice, quiet, luxurious, provincial Hamburg with the sweeping architecture? – I go about eliminating my meat and dairy products – a ham and a cheese sandwich. With butter on them. I’m having my dinner while waiting in the departure line, since getting the masses through security is quite a circus. My friend generously shares her water with me that she bought at Heathrow, and we manage to empty the bottle in time before they take it off us. I’m glad I managed to practice at leisure in Hamburg, so I already know what will set the beeps off. I just tell the security guy to give me a box and merrily start dumping my stuff: digicam and clear plastic resealable baggie of 1l capacity maximum with pastes and liquids in bottles no larger than 100ml each from my backpack (now you can pause for breath), purse, leather travel paper container (the metal detectors are not fond of the concert ticket in it), and of course the backpack itself. And this time, everybody has to take off their shoes as well. After a hot drink we don’t manage to finish, we leg it to our gate, which we reach just in time as it opens. Did I say I switched off my cell phone? Luckily, I’m paranoid enough to double-check, because I find I didn’t. The airplane is an older model and we sink into seats that hardly allow us to peek above the backrests in front of us. This is the only downside to this flight though – apart from the fact they don’t give you a glass of water without charging you 99p for it – since this is the smoothest take off and landing I have ever experienced! And although we leave five minutes late, we actually arrive five minutes early. The first thing I notice as I step off the plane is the air. You know what they say about fresh Highland air? They’re not exaggerating. And no, it’s not raining. We enjoy the moment as we walk across the tarmac – we made it, we’re really in Scotland! This time, our luggage arrives in no time at all, and we head to the taxi stand, which we find deserted. Except for a few other people hoping to flag one. So, I head back inside the airport building and get our taxi organized. While we wait, we enjoy the mild night and listen to the cry of the seagulls. Our ride arrives after a not too long wait, and after our heavy bags have been stored in the boot, my friend heads towards the passenger’s seat, since she prefers to sit in front. Our taxi driver’s reaction: “You can drive if you want.” Oh well, the force of habit… right and left sorted out, we head towards Inverness and I spot my first bilingual road sign at the roundabout: Inverness / Inbhir Nis and Aberdeen / Obar Dheathain. Our driver turns out to be a friendly chatterbox, and after finding out that we’re going to the Runrig concert, he switches to his In Search of Angels CD. The perfect soundtrack for my first drive down a Highland road, through the night. Darkness, exhaustion and the unfamiliar side of the road and the music I know so well make for a disorienting mix, turning almost surreal while I still haven’t fully grasped that we’ve arrived at last, after almost a full year of planning our trip. After pointing out the best pubs to us – which unfortunately we will not be able to hit with our too busy schedule – our driver leaves us at our B&B’s doorstep with a Highland Taxis business card. Our landlord walks us up a side road to a different B&B, because he had lost our booking and was double-booked for the weekend. That very day, he had finally managed to get us accommodated for the night of the concert as well, but we would have to move. 17,000 people are quite a crowd to hit the area, and everything had already been booked solid for months. At our new home – which is very satisfactory – we pretty much drop into our beds after admiring the patterned wallpaper and making our breakfast arrangements. Sounds like just an adventure getting there and a bit of an exhausting trip, then again, traveling, flying and waiting around tends to be. Looking forward to more. ooOOoooo i almost feel as if I've traveled along with you! I love to travel but find the best of it..is getting home! can't wait to read more of your trip cutie! 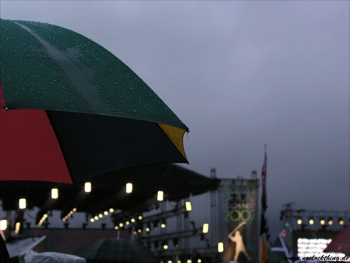 weather: rain, rain and even more rain, and did I mention rain? 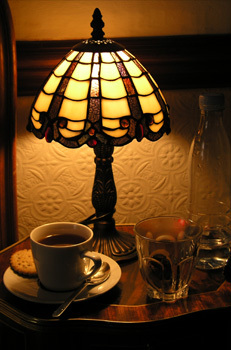 I’m up early, so I sneak down to the breakfast room to have copious amounts of coffee with lots of milk in it while I start writing my diary. My travel companion hasn’t exaggerated, Scottish coffee is good. One hour later, I return upstairs to wake up my friend, and we head down for an excellent Scottish breakfast. Fresh mushrooms, yum! And I try some porridge too, which is salty and makes a good meal, but I think I still prefer my oats as haverbread. We pack our stuff, pay up and head back across the road to base camp, where they get the car and drive us to our next B&B. Once there, we sort through our stuff and talk about what we’ll need to take, check out the community bathroom, organize some towels and stretch our tired backs a bit before we get going. It is noon by then, a fact that I neglect to communicate to my friend in a coherent manner. We find a pretty route along the Ness, and cross it by a small pedestrian only suspended steel bridge that sways with the wind. Through the drizzle, we hear the faint sound of the pipes greeting us from the castle, which reminds me that I really am in Scotland. The plan is to go to Farraline Station first thing to pick up our concert shuttle tickets and to book our trip to Glasgow for the following day. We end up going by a roundabout route, since we don’t check the map often enough. This way, we get to see a bit more of the town, which is nice. The 13:10 to Glasgow is already full, so we decide to take the 11:55 instead, which will turn out to fit perfectly into our schedule the following day. The next order of business is to get some cash, so we can pay our B&B. The guy who uses the cash machine after me doesn’t look too happy though about my sneaking back to grab my receipt, which I had forgotten to pick up. I check the watch and it’s 2pm, perfect for having some lunch before we have to be at the 3pm concert shuttle. At least it would have been perfect, if my travel companion had known the time when she packed her stuff. Expecting us to have enough time to return to our B&B, she didn’t come prepared for the concert, while I thought we had agreed to get ready for it without returning. Exhausted brains don’t communicate very well, it seems. In any case, we need to eat lunch, because we both start feeling dizzy. Luckily, my friend had spotted an Indian place which turns out to be excellent, and I settle the bill while we’re still eating. So, we’re through in half an hour and head for the taxi stand at the train station. Now, this is one of those times when I’m actually glad that I own one of these annoying little mobile phone thingies, because I can just dial up Highland Taxis. The operator tells me the wait is about twenty minutes at the time and we’re so screwed. However – a sight for sore eyes – a taxi going by notices us and is available. While we’re merrily on our way, I explain our problem to the driver, who waits for us as we rush upstairs, get outfitted for cold and rain, grab our stuff and rush back down. Because of the traffic he lets us out one street over, and we make it to the bus station with five minutes to spare. As we join the bus queue, my friend notices that she has accidentally unpacked her bus ticket at the B&B. We decide to pass on panicking and simply head to the counter and ask if she can get on the bus with the printout of my online reservation. We’re lucky again: no problem! We even find good seats in the front and are happy we finally made it! Now we’re on the bus, nothing can prevent us from getting to the concert. Until my friend yells: “My ticket! We have to get off right now!” As she rushes off the bus my brain actually manages to parse the information: her concert ticket is missing as well! So, I get off the bus and accost one of the stewards while my travel companion is busy being off someplace having a nervous breakdown. No, he cannot tell me if she can get in without a ticket, probably not (OK, I admit that was a stupid question). Yes, we can get on a later bus and they will let us on, not a problem. I thank him and see to my friend, who is pretty crushed because she normally doesn’t pull crap like that. I missed Julie Fowlis now anyway, so we decide to have a cup of tea at the bus station and take a time-out. After having relaxed a bit and laughing at the whole affair, we have a look at the concert schedule. My friend wants to see Wolfstone and they’re scheduled at 18:45, so we decide to walk back home – we know the way by now – pick up her ticket, have a little lie-down and take the shuttle at 6pm, since they are going every half hour anyway. Feeling a bit refreshed, we make it back just in time. The place looks deserted. About five minutes later we start wondering where on Earth everybody is, and I go to ask the next best guy in a yellow neon jacket. Turns out the last shuttle left at 4pm, and the next regular bus won’t go until 8:15. Swell. This won’t do at all, since Runrig are due to be on at 8:45, and if they’re on time we’re screwed. So, back to the train station it is, where a taxi is pulling up the very second we hit the taxi stand. I decide we’ll cough up the 20 quid and off we go Drumnadrochitwards. Finally! We get into a traffic jam someplace between Drumnadrochit and Lewiston, so we pay the driver to release him from his misery and walk the rest of the way, which isn’t far. It is just as well we came equipped for hillwalking, because the drizzle has turned to rain and the place is already a mud bath. We spend the last few songs of the Wolfstone set in the toilet queue, being slightly amused by the inadequate footwear of the ladies in front of us. Two young guys with Scotland flags on their backs decide to get into the spirit of the thing and slide through the mud headfirst. Everybody else they come too close to is less pleased, but they are being nice and don’t give anybody any hugs. After our visit to the portaloos – with bona fide toilet paper! – we enter the venue, which is flat ground and has a rectangular layout with eateries on each side. First order of business for me is to hit the merchandise stand for the obligatory t-shirt. I – yes, me! – forgo the special edition whisky though, because it would never survive the cargo hold on the plane ride back anyway, and I’m not one to gulp down a quality Single Malt in two weeks. We decide to take a stroll through the venue to find a good spot, and we pick a space on the left where the big camera crane won’t get into our line of sight, and where we will have both side screens and the stage itself in view. There are quite a number of people with folding chairs in that area, so the ground is less trampled and you can actually see some surviving grass. 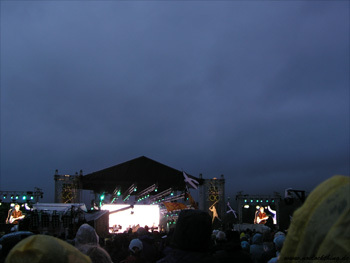 The backdrop towards our left is a hill whose top is engulfed in clouds, and on the right we can see the ground sloping up and some people gathering to watch from out there. Our strategy planned, we head off to a baguette stand to have our dinner while the Red Hot Chili Pipers come on. We then make it back to our selected spot. Since it’s a bit back from the front, we can stand freely. I have a folding chair in front of me, so nobody tall will be blocking my view. Before Runrig come on, the announcer asks everybody to take their brollies down, so nobody’s view is obstructed. As Runrig start playing, it seems like there’s no-one else singing and clapping around me, but I decide what the heck and sing even louder. Still, it takes me a bit to get into the spirit, because I’m already exhausted from our two long days of rushing from one place to the next chasing our transport and accommodation. An Toll Dubh and Sona do the trick for me, I just love the Gaelic stuff! Then the sun goes down and they start playing The Engine Room. The audience is lit a bit, and the backdrop of the coloured lights on stage looks plain amazing. Some people combined their own countries’ flags with the Scotland flag on long poles, so you can see where everybody’s coming from. On the left and right monitors you can see close-ups of the band playing, and they made new background films, which they show on a huge screen on the back of the stage, mixed in with older ones. For some songs they have created abstract films that are basically slowly moving or even still lights in monochromatic colour schemes. Very atmospheric, especially through the prism of the raindrops on my glasses. And I learn something new: to keep clapping your hands hurts when they’re wet! Like I care. And my rain jacket has straps with fasteners to draw the sleeves shut and they insist on getting caught in each other and tangling up. So, I draw them tight and pull the loops over my hands, with the effect that I can’t really raise my arms anymore to clap overhead. About halfway through I have created two new little Loch Nesses: one for my left and one for my right boot. As far as I can tell, the set is the same as in Hamburg a month ago, but they have two guest musicians: Laura McGhee on the fiddle and Gary Innes on the accordion, and the drum section in A Reiteach has been rearranged again. They finish with This Day while showing video sequences of the day in the background. Yeah, rub it in folks, show us what we missed. The drummer, Iain Bayne, gets a special mention for coming up with the idea and organizing the event, and the audience gets one too for having stuck it out in the rain all day. As we walk towards the exit, we notice that the mud in the back has turned liquid by now. 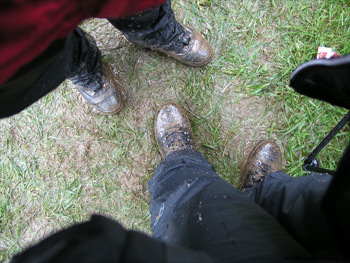 Again, we are thankful for our hiking boots and rain pants. Part of the road has been cordoned off, so everybody can walk safely through Lewiston up to Drumnadrochit bus station, which makes quite a long walk through the dark after a long and exhausting day. It doesn’t help that my friend’s blood pressure has been acting up from around the sixth song in the set and she’s feeling dizzy. At one point they guide us off the main road through a side street – “campers, car park and bussies that way!” – apparently, we’re the bussies. At the bus station, we first come upon the Glasgow and Edinburgh shuttles. So, we ask where to go, and the steward points South and says “Inverness that way!” Wasn’t Inverness to the North? Noticing our confused looks he explains about the queue that we can’t see for the busses. After about ten minutes wait, the busses start pulling up and we can get onto the second one. The steward who collects our tickets is the same one I talked to at Farraline Station after we noticed the missing concert ticket, and he’s happy to se we made it after all. Off we ride into the night. On the seat in front of me is a guy with a Saltire painted on his face. He made the mistake of touching it, so his hands are blue. At some point he and his girlfriend signal the bus driver and he lets them off. I can’t see where we are in the gloom, but we must have come up Glenurquhart Road where our B&B is located, and we missed the chance to be dropped off and stay on all the way downtown. We head towards the taxi stand, but the only taxi we find there is already booked. The driver points us to the office, which is just around the corner. They kindly let us in, although they’re supposed to keep the door closed after dark. We book our taxi and wait together with a bunch of soaked and shivering Riggies, while our hillwalking gear catches the odd envious glance. The office is also Highland Taxis’ call centre, and we pass the time watching them work. “Highland Taxis… that’s about forty-five minutes at the moment… hello? Hello?” There are nicer ways of saying no, thank you to the operator. After said forty-five minutes, the taxi assigned to us still hasn’t arrived, but as a driver whose fare seems to have wandered off comes in we grab our chance, and he takes us home where we collapse onto our beds around 1am. It sounds like an exhausting adventure that day, but well worth it for the concert, and it sounds like things didn't get too wild. 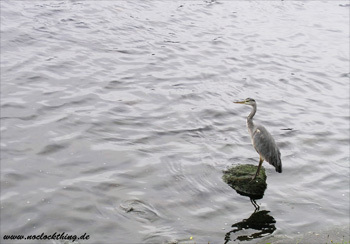 I really liked that picture of the river Ness with the lonely bird, the river Ness any relation to Loch Ness? Scotland is beautiful and I"m sure you'd have enjoyed it much more without all the crowds and running about. yeah I once enjoyed a tour of Scotland..
that is until the cops ran me off! and that guy kinda complained 'cause I was up his kilt..
Ketana wrote: yeah I once enjoyed a tour of Scotland.. Playing with the haggis again, Ketana? The latest time we can have breakfast is at 8:30. As the alarm clock goes off I manage to slip into the bathroom, since one of the Italian guys has forgotten to bring a towel and kindly agrees to surrender the key for two minutes. I have trouble waking my friend who is totally conked out, but I succeed on my second attempt. We turn out to be late for breakfast, because some woman is hogging the bathroom for half an hour – that Italian party is quite big. After breakfast I manage to sweet-talk one of them into surrendering the bathroom key, so we can have a quick wash-up. After packing, we call up our base camp and they come to pick us up and drive us to the bus station. Our would-have-been landlord can’t believe his ears as we tell him the story of our mishaps the previous day, and he apologizes again for the double booking. The B&Bs we stayed at were more expensive than the one we booked, so he makes up for the difference. We’re booked on the 11:55 but to Glasgow and we still have about an hour, so we settle at the station’s café for tea and water and a little chat. One of my friends from the Gaelic Learner’s Corner recognizes us and comes over for a quick chat. We speak English though because we’re not alone, so the only Gaelic words we exchange are a quick “Chì mi thu!” before we have to go. Then it’s time to get on the bus and off we go through Perth towards Glasgow, with the countryside around us getting steadily flatter. I finally find some time to relax and unwind, to finally reflect and savour the moment and the concert. It settles around me like a warm glow while we pass through the mountains, which come in all hues and violets and reds and greens. The bus is on time, so we reach Buchanan Bus Station at 15:50. The taxis in Glasgow look quite old-fashioned, which makes them instantly recognizable. As expected, we hit our first linguistic problems, since we don’t speak Glaswegian. We name our destination and we think the driver is asking us if it’s Kelvinside, which we confirm. 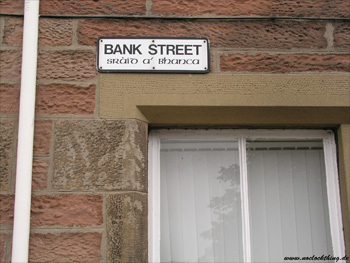 What he actually does ask is if it’s Kelvingrove Street. Luckily, that’s on the way to our destination anyway, just a few streets over. We probably should just have said “Alamo Guest House”, but he doesn’t understand me on my first attempt on that either. 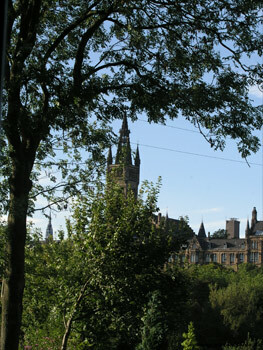 Our B&B is beautifully located, just off Kelvingrove Park. It’s a Victorian house. Luckily, the owner speaks a very clear English, so no communication problems there. As he shows us around the premises we ooh and aah at the view from the breakfast room where we get a clear view of Glasgow University, and above all the colourful Victorian ceiling! He informs us that he spent three months on his back painting it. There is old furniture, carpets and mirrors all around, clearly arranged with love. And there’s a huge communal bathtub which my friend inaugurates while I try out the en-suite digital shower with the massage head. Pure bliss! We pick a curry shop from our travel guide to have dinner in, and cut through Kelvingrove Park past the South end of the university. After a few wrong turns, we finally do manage to find Ashton Lane. However, the place happens to be too noisy for the likes of us in our exhausted state, so we walk down Byres Road until we hit a pub called Tennent’s, and choose a table. It is full of little sayings, above the bar is inscribed: “The easiest way to make ends meet is to get off your own”. As is customary in British pubs, I walk up to the bar to place and pay for our order, then sit back down at our table. The waitress then informs me that the lasagne I ordered isn’t available. So, I pick something else from the menu – fortunately, I’m a quick chooser – which they ran out of as well, so sorry! I try my hand at a bit of Scottish humour: “What do you have?” She asks me if having tagliatelli with my garlic bread would be fine, which it is. And she brings us a bowl of the obligatory chips with our dinner, which we only manage to nibble at due to the late hour. They’re very good though! After dinner, my friend decides to have that beer after all, and boldly walks up to the bar. I see her ending up with two beers and having a discussion with the barmaid. As it turns out, we have another linguistic calamity at our hands. She ordered “A Guinness … and a small one” and everybody understood what she wanted – except, of course, the barmaid who gave her exactly what she asked for: a pint and a half-pint! 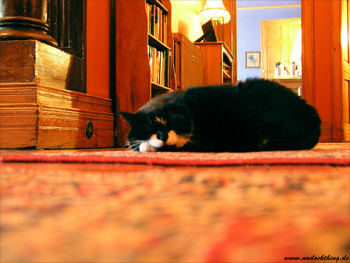 Back at the B&B, my travel companion almost trips over the fat cat, which I promptly nickname Blob. We contribute even further to its pampered state by copious scratching behind the ears. We find out later that his name is actually Flash! The fat cat - this is actually a flattering picture! LOL @ the cat. 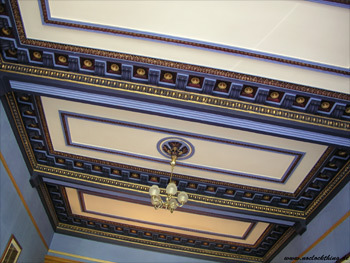 What a beautiful ceiling, I love seeing stuff like that and have always hoped to travel abroad someday. How absolutely scrumptious!! what a beatiful view and the B&B is simply stunning! how lucky you gals were in seeing all of this!